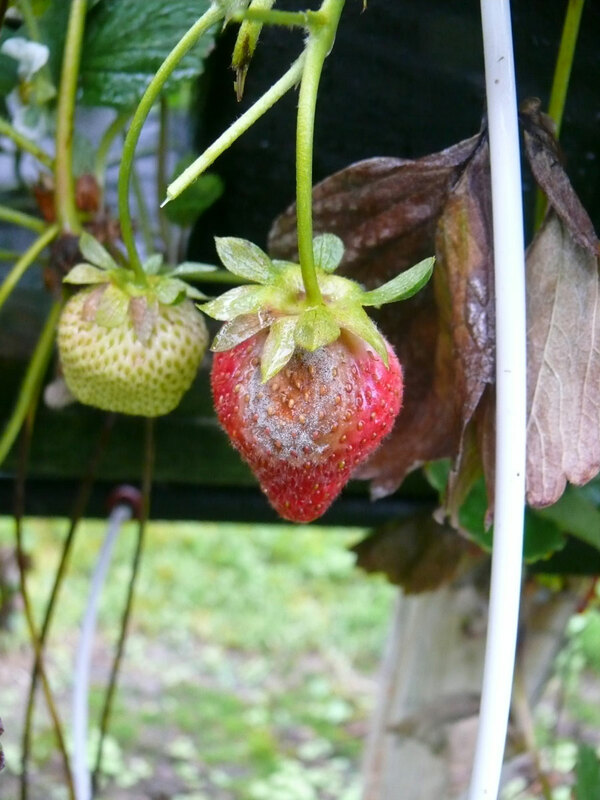 ID/Disease Cycle: Symptoms of gray mold include light brown areas on fruit; a powdery gray growth produced on rotted fruit and leaf tissue; and whole rotted berries that retain their general shape but become tough and dry. The fungus overwinters in living plant tissue and proliferates in the spring as leaves die. Favored by cool, wet weather, the fungus infects new blossom tissue and remains latent until fruit starts to ripen. Then visible symptoms occur. Secondary infections may occur when spores that cling to ripening fruit germinate in moist packaging conditions after the fruit is harvested, causing uncontrollable storage rots. Damage: The main damage to the crop is from reduced quantity and quality of yield. In years when wet weather prevails during bloom and ripening periods, significant crop losses can occur. Monitoring: Consult scouting records from previous years to determine if carry-over inoculum is likely to be present. Scout fields weekly in the current year starting in the pre-bloom period for symptoms. Monitor weather conditions especially during bloom to determine if infection periods are imminent or have occurred. Cultural/Biological: follow recommended practices in table below. • Apply recommended fungicides starting at bloom, especially if field history or present weather conditions indicate high risk of disease infection. • Repeat applications during bloom and early fruitset only if weather conditions are conducive to disease development. • Continue applications as fruit ripens only if disease is found present in the field and weather conditions are conducive to disease development. • Rotate fungicide materials from different FRAC groups to avoid promoting the development of resistant strains of this disease. Plant on sites with good air and soil drainage to promote plant health. Maintain adequate spacing between plants and rows to allow for good air circulation, drying conditions and spray penetration. Avoid excessive nitrogen applications that will stimulate dense canopies and inhibit air circulation and spray penetration. Use drip irrigation to avoid the splashing water that results from overhead irrigation. Maintain a good mulch cover on the soil to lessen splashing from rain or overhead irrigation. Harvest frequently and remove from the field promptly any infected plant tissue as soon as it is seen. Refrigerate harvested fruit promptly after harvest to maintain shelf life and quality. Conduct seasonal renovation practices, including mowing, to interrupt disease build-up in the field and encourage strong and vigorous plant growth. ID/Life Cycle: The raspberry fruitworm is a small brown beetle that feeds on the flower buds and leaves of raspberry plants during the spring and early summer. Larvae are small, yellowish white and feed on fruit, often being found inside fruit when pulled from receptacle. Raspberry fruitworm overwinter as adults, emerging in early May. Female beetles lay eggs on the flowers and green fruit. The larvae emerge and feed on the receptacle inside the developing fruit. Damage: Adult feeding on foliage and flowers can cause significant damage. Larvae can cause significant damage to fruit and may end up in the harvested fruit, greatly reducing customer appeal. Monitoring: Scout rows for small holes chewed in flower buds and young leaves that tattered in appearance. This is the result of adult feeding along the midribs of unfolding leaves. Adults (beetles) tend to be most active and noticeable on plants in the early evening hours. Apply recommended insecticides to control adults prior to egg laying if adult feeding damage is noted. Apply follow-up sprays if scouting indicates continued feeding. Rotate insecticides from different IRAC groups to reduce the chance of resistance development in the pest. ID/Life Cycle: Both Cranberry Fruitworm and Cherry Fruitworm are native to North America, as are the blueberries they infest. 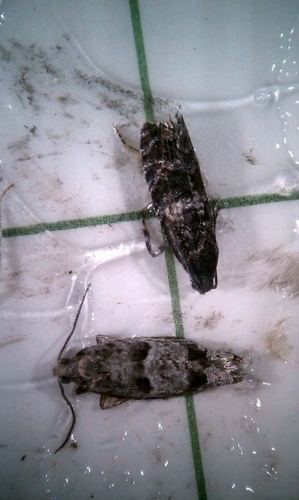 The adult forms of these fruitworms are small brownish-gray or grayish-black moths. Eggs are laid near the calyx of green fruit and are pale creamy color. Larvae found within blueberry fruit in June are small and pale yellowish green in color. Fruitworms overwinter as larvae and pupate in the spring, emerging as adult moths after the start of bloom and usually before early fruit set. Once mated, moths move into blueberry plantings when fruit is small and green to lay eggs directly on the fruit. Larvae then tunnel into the fruit and begin feeding. Infested fruit turn prematurely blue making them easy to identify when scouting. Larvae will consume from 3-6 berries, filling them with brown frass, and web together fruit with silk. Upon reaching maturity, larvae leave the berries and move to over-wintering sites in nearby woods or hedgerows. There is one generation per year. 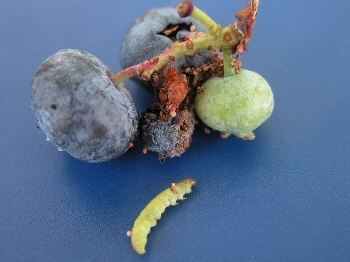 Damage: Larvae feed on ripening fruit. Feeding reduces the crop and spoils marketability of the berries. 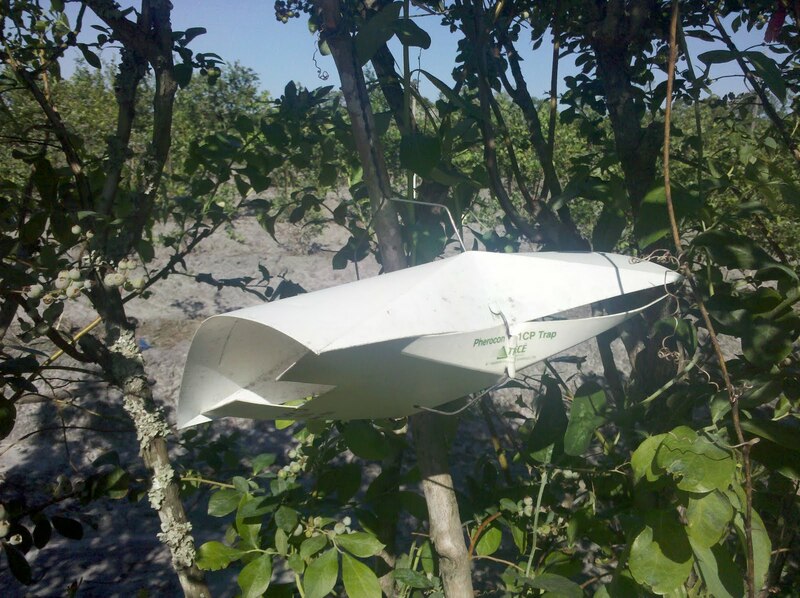 Monitoring: Pheromone traps can be used to monitor male populations of this pest and helps to identify the initial flight into a blueberry planting. Traps should be placed immediately after bloom. Monitor trap catches twice weekly and remove trap catches in order to identify a peak flight. Secondary scouting can be done for egg laying by inspecting green fruit with a hand lens. Scout the periphery of the planting especially near woods and hedgerows. Finally, scout for infested fruit by looking for prematurely pigmented berries. Apply recommended insecticides beginning one week after peak trap catches which usually coincide with berry-touch. Use pesticides that are less toxic to predators (e.g., insect growth regulators or B.t. products) to promote populations of natural enemies. Eliminate weeds and trash around plants to cut down on overwintering protection for larvae. Clean cultivate between rows to disrupt pupation sites and reduce the population of this pest. Hand pick and destroy infested fruit in small plantings. Preserve natural enemies whenever possible by selecting spray materials that are less toxic to beneficials.